Uskowi on Iran - اسکویی در باره ایران: Is Iraqi Kurdistan Exporting Oil through Iran? The Ministry of Natural Resources of Kurdistan Regional Government (KRG) denied reports that the Kurdish government is exporting crude oil to Asia via Iranian ports. 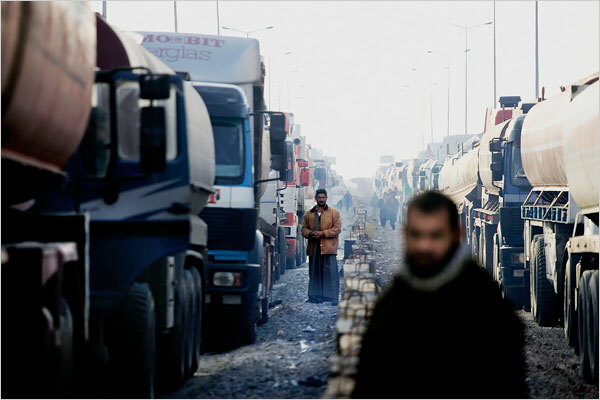 Yesterday, Reuters reported that Iraqi Kurdistan has opened oil trade route via Iran; exporting crude by truck to the Iranian ports of Bandar Abbas and Bandar Imam Khomeini for shipping to Asia. But the same spokesman also told Asharq Al-Awsat that some crude oil from Kurdistan is being trucked to Bandar Imam Khomeini. Another official at the Kurdish oil industry told the newspaper that the amount of crude oil exported through Iran could be as much as 30,000 barrels per day (bpd). This is an important development as both Iraqi and Syrian Kurds are increasingly dependent on Iran and look at it as their protector . Iranian Kurds are the best integrated in the Iranian national fabric and are champions of Iranian Kurdish policy. The Sepah and Artesh have a high number of Kurdish origin senior officers. Iranian Kurds and Khuzestani Arabs showed their complete loyalty to Iran during the Jange Tahmili when they fought fiercely to defend Iranian soil. Iran has upheld their trust by complete inclusion at the highest levels of government and society. So we're told that Iranian crude exports are down but somehow Iraqi-Kurd exports are successfully using Iranian ports? I'd be interested in hearing more about the logistics involved in this process. And I'd also be interested in hearing about the reverse process, involving clandestine Iran through Iraq (Baghdad govt.) exporting of crude. Let the numbers ,figures and statistics fool the bully imperial powers!-I THINK if the US wish to strangle IRAN economically, then it needs to uproot the Nation ,plant it in the middle of the INDIAN ocean then surround it by warships! !.